After quite a bit of online research regarding all things polymer clay, I’ve finally taken my first leap into the medium — crafting homemade buttons. I started out with some el-cheapo clay (Sculpey) which a lot of people apparently gripe about in terms of durability. But as I don’t plan on machine washing these buttons nor do I predict any delicate figurine sculpting in my future, I reckoned it was safe to take the thrifty route for my first attempt. I thought that it would be a good idea to make molds out of some buttons from my stash, so I bought some of this molding compound which was super easy to use. I simply followed those abbreviated directions on the side of the box and it seemed to work fine. Thing is, though making the molds was easy, using them was another thing entirely. 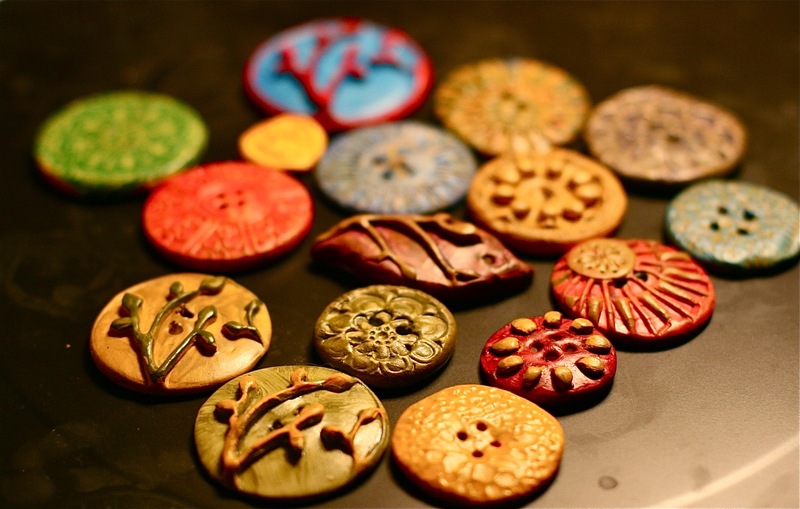 Too impatient to look up more online tutorials, I set my molds aside and proceeded to roll little balls of the clay and stamp them down into discs using some textured trinkets (pendants mostly) from my jewelry box. 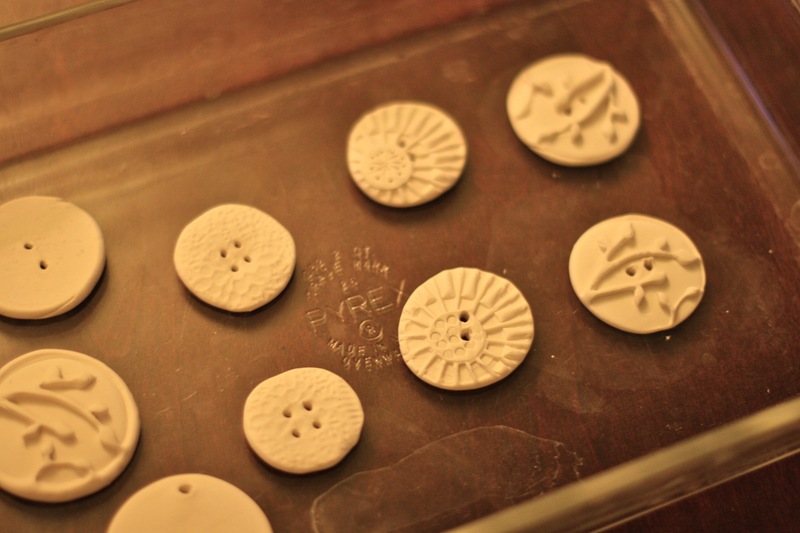 I made texture stamp molds of some decorative surfaces so the designs on my buttons would be in relief rather than in grooves (make sense?). I pricked buttonholes with a toothpick, baked them as directed, let them cool, and went to town with acrylic paint. Also decoupaged a few (like the green one pictured at bottom right below) with some ink-jet-printed tissue paper. I love the results! Really can’t believe how quick and easy these were to make. Now to practice my molding skills. wow, those are amazing! 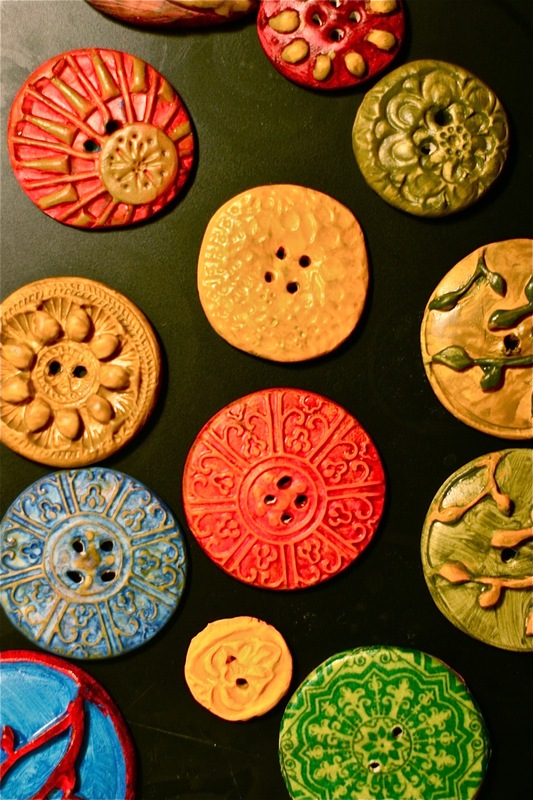 i never even considered that buttons wre something one could make at home. that green one is fabulous. These are great. i’ve been trying to make blank pendants with polymer clay to later add images but find my finger prints keep ruining them, any tips? @craftytips – i’m a total beginner using polyclay so might not have the best advice. my work, too, has its fair share of fingerprints! the only way i avoided them was to flatten the discs directly onto the baking surface itself and put that into the oven untouched — that is, if it looked right after flattening. if not, i picked up my little ball of clay, kneaded, and tried it again. hope this helps! By the way I love your tag line ‘Thanks but i’d rather stay in and make stuff’ – wow, you hit the nail on the head. It’s all I want to do! hi, I tried making sculpy buttons but I couldn’t get them out of the mold with out distorting them, or do you bake them in the mold? (although I made molds out of sculpy that was baked – not molding compound) one more question, you used plain white sculpy clay not colored, right? they look great- good idea on the decoupage. I have been wanting to make custom buttons for but was really discouraged after my first attempt.